A movement is afoot to make the historically rich but deteriorating Historic Fort Wayne in Southwest Detroit into a national park, Bridge Magazine has learned. As construction is set to begin this fall on the $4.5 billion Gordie Howe International Bridge linking Detroit and Windsor, Ontario, community and state leaders increasingly are focusing on the future of the fort grounds that lie directly to the east. Proponents believe a law crafted by former U.S. Sen. Carl Levin, D-Detroit, would require the U.S. Department of Interior to grant the land park status if the city signs over the deed to the fort. Such a designation would open federal funding to restore the property, develop it into an attraction and manage it in perpetuity. Related: A new bridge is dawning in Detroit. Matty Moroun isn’t the only one unhappy. “I definitely, hopefully think there’s some momentum in that direction,” Chang said. The law, which helped create the River Raisin National Battlefield Park in Monroe, applies to land with historical connections to the War of 1812. While Fort Wayne wasn’t built until more than 30 years later, some of the war’s first skirmishes were on its land. Levin and aides to Gov. Rick Snyder are involved in the discussions, Bridge has learned from four sources involved in the talks. They’re enamored of a potential tourist destination next to an international border crossing, and liken the concept to Colonial Michilimackinac state park in Mackinaw City near the Mackinac Bridge. One big sticking point, according to the sources: Detroit Mayor Mike Duggan hasn’t embraced the idea. The city owns all three deeds to the property, and the concept can’t move forward without Duggan’s support. The mayor is studying the issue and hasn't taken a position, Duggan spokesman John Roach said. The talks have intensified following a draft of a $235,000 study on revitalizing the fort from a New York firm, HR&A Advisors, commissioned by Michigan’s Economic Development Corp. The state has some jurisdiction over Fort Wayne because it’s on the federal National Register of Historic Places. 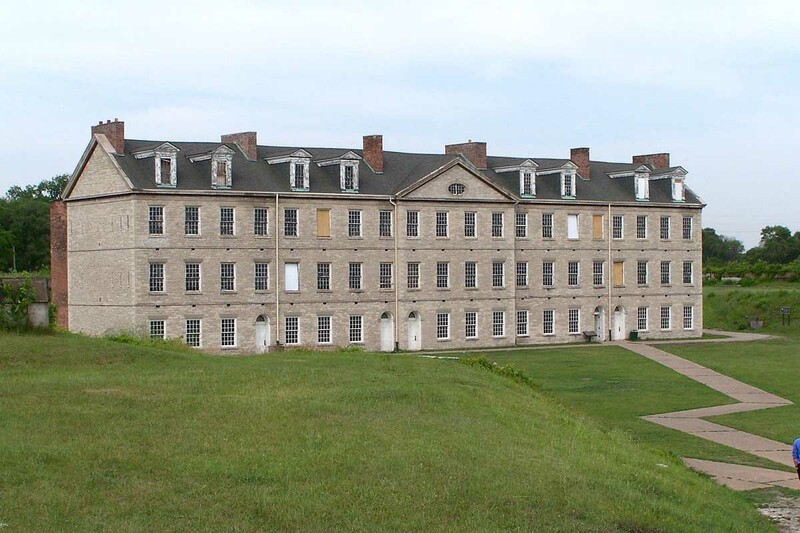 Although many of the buildings on the property are deteriorating, the fort itself is well maintained and is well known to generations of southeast Michigan residents as a field trip destination. The fort is now maintained by volunteers. Over the years, plans have come and gone to revive the property, from bringing in concert acts to hosting car races on the grounds. Beyond buy-in from Duggan, numerous logistical hurdles remain to giving the fort national recognition. River Raisin, the nation’s only War of 1812 battlefield park, was designated as such in 2010 by the administration of Democratic President Barack Obama after years of lobbying by Levin and other Democrats. Republican President Donald Trump perhaps would look far less favorably on such a designation and funding. And unlike other historic sites, Historic Fort Wayne has served so many uses over the years that it lacks an easy narrative. The property includes American Indian burial grounds that date back 1,000 years. Construction of the fort started amid tensions with the British in 1842, and ended long after they cooled in 1851. During the Civil War, the fort was an induction center for soldiers. In the Red Scare, it housed accused communists. During World War II, it was a depot for every Jeep and tank made in Detroit. And after the 1967 riots, the fort housed displaced families. Besides the fort, the property now houses the Army Corps of Engineers, the Tuskegee Airmen National Historical Museum as well as a warehouse for the Detroit Historical Society. “We’ve heard the talk about a national park, but nobody knows what will happen,” said Jeremy Dimick, manager of collections for the Detroit Historical Society. Now aren't we being told about the vast backup of unfunded and untouched maintenance sitting out there in in our existing national parks? So making a new one helps how? Why doesn't Detroit make it into its own park? Oh wait, they don't want to pay for it. This has gotten to be an all to common theme with humanity in general which Bridge writers seemingly love to cover. We want X, Z and Z ... and want some one else too pay for it, should be filed with dog bites man stories! Whether you look at clean water, safe roads, clean air, or adequate education our common wealth is being degraded. The reason why there isn't enough (government) money to pay for maintaining parks (and these other things ) is that state and federal government is controlled by politicians whose priority is giving big tax cuts to the wealthy rather than taking care of the country. We are well on our way to becoming like Guatemala. Paul, government spending is close to historical averages. You are confusing spending and taxes. Simple fact it is entitlements that are eating an ever increasing percentage of government spending which is starving other needs. Seems to be another pattern, is the people complaining about taxes being too low are exactly the people who pay the least and expect to continue being so. I hope this comes to fruition. it is a valuable piece of property, and its current status is very sad. Between the Gordie Howe bridge, and the proposed Ford campus including the Michigan Central station, and a revived Fort Wayne, this would be a terrific boost to that area of the city and to the region. What role would Detroit City Council play in transferring the property deeds? Does the mayor have that much say in decisions like this? That's a great point and a regretful omission. I will update the story. Thanks so much for pointing it out. I think making it a national park is a great idea! We put on a car show every year to raise money of the upkeep of the fort. We had over 150 cars and raised over $3000. It doesn't sound like a lot, but it helps. Volunteers have learned how to stretch each dollar. All details about the show can be found on our Facebook page. You can also download a copy of the poster, with all of the show details, from there that you can re-post if you like. look up "Historic Fort Wayne Motor Show" on Facebook. If you can't find them, I can help. In June ,1953, my husband, Don Vreeland was drafted, He grew up in Grand Rapids, where he boarded a bus to be inducted into the service at Fort Wayne. We made a special trip around 2011 to visit the fort. Indeed , it is a beautiful site on the Detroit River. Volunteers were doing an awesome job. It was my first visit to the Fort, which was an eye opener for me. Michiganders and Detroiters need to benefit from knowing the history of this corner of Michigan. Kudos to the dedicated folks working on preserving the fort any ways they can. I'm puzzled and bewildered. This money is needed for schools, education and potholes instead the sophisticates commenting here want to build another edifice to old people's memories. They ignore reality and want to live in the past while Rome crumbles around them. Get real folks! Fort Wayne will still be there after we conquer the ill's of poor education and pot holes. Traverse City has been able to retain the architectural integrity of the old state hospital and generate property taxes at the same time. Valuable old buildings are restored, maintained and contributing to the economic viability of the city. If there's money to be made from Fort Wayne as an historical site that will attract residents of Detroit and the metro area, students, Canadians, historical buffs, tourists, and others, perhaps a public-private partnership is the way to go. It's certain that the volunteers who help to maintain the place have ideas. There would be need for some commercial development to make a go of a partnership. There would be very little or no public money behind such a partnership. I'd say, "Dream on." All I recall of the place was a dreary rainy day taking a draft physical a few months before induction, basic and AIT, and a year long government paid vacation in Vietnam.